In this month’s episode of “Obscure Monthly Designations,” July is Parks and Recreation Month. There’s quite a few parks in Mason County, and quite a bit of stuff to do, but we’ve only got one state park. Today, Tu-Endie-Wei is a small, well-manicured park, but it wasn’t always that way. In 1827, the editor of The Spirit of the Old Dominion made a visit to Point Pleasant. I’m sure he was expecting to find a nice little park where he could pay his respects to the dead. Instead, he found that “fifty years have passed, and the remains of the gallant Lewis and his officers are yet suffered to moulder within the unhallowed precincts of a stable yard.” No doubt, this is the stable yard of Newman’s Tavern, now known as the Mansion House. There were no monuments to their bravery, not even a marker for their graves. Many western Virginians, especially those from the Shenandoah and Kanawha Valleys, saw this as eastern Virginia’s blatant disregard for the sacrifices made at Point Pleasant. Another twenty years went by before anyone in Virginia’s State Legislature saw fit to try and fix their mistakes. In both 1849 and 1860, acts were passed which would’ve purchased the land and built a monument. However, the Civil War soon split Virginia into two separate states, and Point Pleasant found itself under a new state government, one that had more important things to worry about than a park. So, as any self-respecting county would, we took the matter upon ourselves. In 1874, for the 100th anniversary of the battle, Point Pleasant held one of its largest celebrations on record. Beginning at what is today the riverfront entrance, a grand parade made its way up Main Street, past the courthouse, to the fairgrounds (near Pleasant Valley Hospital). The procession was led by WVU’s Corp of Cadets and contained not one, but three brass bands from Gallipolis, Point Pleasant, and Ravenswood. Once everybody was gathered at the fairgrounds, music was played, and speeches were made. A call was also made, in front of the entire crowd, for donations towards buying the land at the Point and building a monument. As it’s told by the Weekly Register, only one man shouted out his opposition, and he was promptly escorted away lest he get himself hurt. That day alone, the citizens of Mason, Gallia, and Jackson Counties raised over $600. Following lunch, the procession returned to the courthouse, where they met a casket containing remains from the battlefield. It was escorted to Tu-Endie-Wei for reburial. Apparently, this grand celebration provided the guilt necessary for further action in Charleston. The following year, the state provided $3,500 towards a monument. This money sat forgotten until 1901, gaining interest every year. It wasn’t until 1901 that both Virgil Lewis and Livia Poffenbarger approached the state government once again, and the funds were rediscovered. By then, the account totaled $8,788. Both were also told that the Ladies Monument Association also had $2,078, $600 of which was from the celebration of 1874. 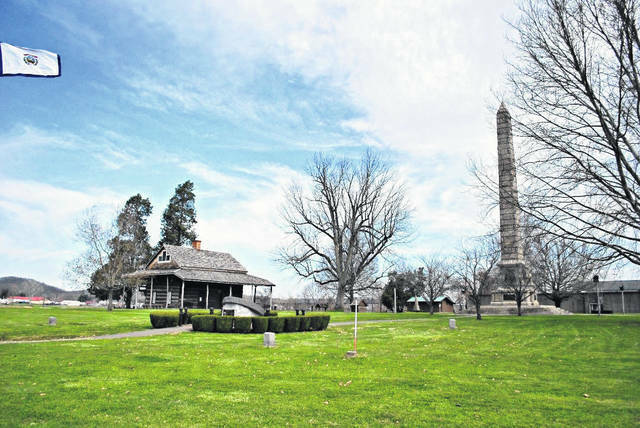 With this money, $10,866 in total, the Point Pleasant Battle Monument Commission bought what was then four acres of land at the Point and christened it Tu-Endie-Wei, meaning “the point where two waters meet” in the Wyandot language. The next seven years were spent lobbying the state and federal governments for help with the monument. The state acted first, appropriating $5,000 in 1905. Three years later, after denying him twice, Congress was persuaded by local congressmen Charles E. Hogg to put $10,000 towards a monument at Point Pleasant. That was plenty, and the Battle Monument was finished by the next year. Finally, 135 years later, a suitable monument marked the battlefield upon which 46 Virginians lost their lives. For the next 40 years, the Daughters of the American Revolution managed the Mansion House and park. They also added new monuments, some to soldiers of the American Revolution and others to soldiers of the Great War (This one has since been moved to the courthouse). This era also saw the reburial of Anne Bailey and Chief Cornstalk within the park. Finally, in 1956, Tu-Endie-Wei was absorbed into the state park system. The next meeting of the Mason County will be the week of August 13, with a date, time, and location to be announced next week. Information from Virgil Lewis’ “History of the Battle of Point Pleasant,” Livia Poffenbarger’s “Battle of Point Pleasant,” the Weekly Register, and the state park system.